the lateral extension of the spine of the scapula, forming the highest point of the shoulder. adj., adj acro´mial. 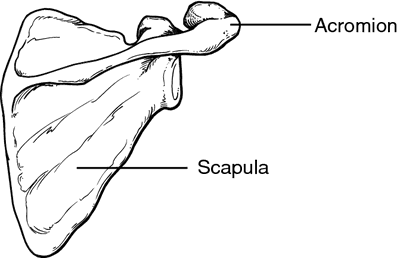 Posterior (dorsal) surface of the scapula, showing the acromion. From Dorland's, 2000. (ă-krō'mē-on), [TA] Avoid the misspelling achromion. The lateral extension of the spine of the scapula that projects as a broad flattened process overhanging the glenoid fossa; it articulates with the clavicle and gives attachment to part of the deltoid muscles. Its lateral border is a palpable landmark ("the point of the shoulder"). /acro·mi·on/ (ah-kro´me-on) the lateral extension of the spine of the scapula, forming the highest point of the shoulder. the lateral extension of the spine of the scapula, forming the highest point of the shoulder and connecting with the clavicle at a small oval surface in the middle of the spine. It gives attachment to the deltoid and trapezius muscles. Also called acromion process. Compare coracoid process. acromial, adj. The flattened lateral, vaguely triangular projection of the spine of the scapula that forms the highest point of the shoulder and articulates with the clavicle. The acromion forms the point of attachment for the trapezius and deltoid muscles; medially, the acromion articulates with the lateral end of the clavicle, immediately behind the attachment of the coracoacromial ligament, the latter of which, in conjunction with the acromion and the coracoid process, forms an arch over the glenohumeral joint, preventing its upward dislocation and limiting the upward rotation of the humerus. The acromion is recognised by its thickened lateral border, which is a palpable subcutaneous mass. The lateral end of the spine of the scapula, which projects as a broad flattened process overhanging the glenoid fossa; it articulates with the clavicle and gives attachment to parts of the deltoid and trapezius muscles. The outermost extremity of the spine of the shoulder-blade. The acromion is joined to the outer tip of the collar bone (clavicle) in the acromioclavicular joint. the ventral prolongation of the spine of the shoulder blade or SCAPULA. the prominence at the distal end of the spine of the scapula. The acromioglenoid distance is the space between tip of acromion process and the supraglenoid tubercle (fig. Shapes of acromion process and glenoid cavity were observed. Thickness of acromion process was higher on the right scapulae with mean values of 6. Table 15 and chart 2 shows distribution of acromion process shape among the study group. Acromion process plays a significant role in formation and stability of shoulder joint. Acromion process was classified into three types on the basis of its shape into triangular, quadrangular, and tubular by Mansur et al. A morphometric study of acromion process of scapula and its clinical significance. Morphometry of acromion process of human scapulae and its clinical importance amongst Nepalese population. They found that while they could move the cursor from the starting position to the vicinity of the target circle more quickly with the position control scheme, locating and holding the cursor within the target (which required holding the acromion process at a precise point in three-dimensional space, away from its rest position) proved difficult because the shoulder was subject to tremors that prevented the cursor from settling within the target. Displacement and forces (mean [+ or -] standard error) exerted at acromion process. The therapist kneels laterally and superiorly to the patients shoulder and positions his two thumbs back to back, with the tips in contact with the posterior surface of the head of humerus adjacent to the acromion process and pointing towards ceiling. One was described by lines between the markers on dorsal side of distal forearm (wrist marker), elbow joint (humerus marker) and acromion process of the throwing shoulder (shoulder marker), and the other was described by lines between markers on the humerus marker, the shoulder marker, and the spinous process of the 8th thoracic vertebrae (Th 8 marker) (Figure 1a).